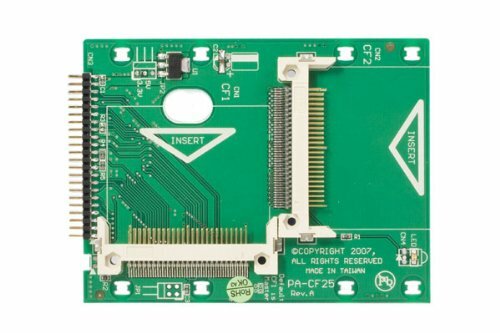 This 2.5in IDE to Dual Compact Flash SSD Adapter Card allows you to convert one or two Compact Flash (CF type I/II) cards or MicroDrives into a bootable IDE Solid State Drive - a simple and convenient way to replace a 2.5in IDE hard disk drive. The IDE to Dual CF adapter card makes it easy to build your own do-it-yourself SSD (requires CF card or Micro Drive), allowing you to take advantage of the benefits that Solid State storage has to offer. With no moving parts, a SSD is the ideal addition to virtually any working environment, because it provides cooler and quieter storage than a conventional hard disk drive. Plus, Solid State drives are less susceptible to atmospheric hazards (e.g. dust particles, atmospheric changes etc. ), ensuring seamless performance regardless of environmental factors. A highly reliable storage solution, the IDE to Compact Flash SSD Adapter Card is backed by StarTech.com's Lifetime Warranty and free, lifetime technical support.